According to the Maternity Experiences Survey (MES**), in 2006-2007, almost 58% percent of Canadian women reported that they took folic acid three months prior to pregnancy. More women, almost 90%, took folic acid during the first three months of pregnancy. 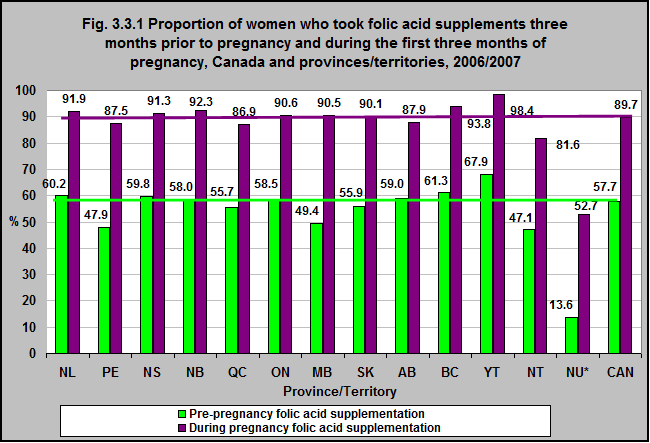 Higher proportions of women took folic acid before and during their pregnancies in the Yukon as compared to the rest of Canada. 1Motherisk. Taking Folic Acid Before You Become Pregnant. 2017. http://www.motherisk.org/women/folicAcid.jsp – accessed July 18, 2017.